Lesson: Using SketchList 3D to generate reports. 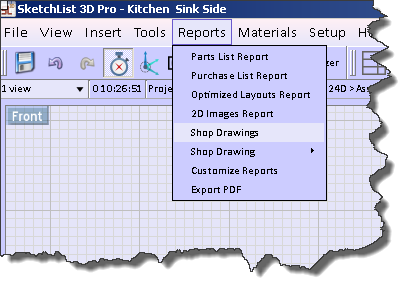 Summary: One basic concept in SketchList 3-D is that designing and reporting are integrated. Changes to the design are automatically and instantly changed in the reports. Each report has a set up stage where you specify the types of information that you want to display in the report. But these setups can be saved as standard reports and used over and over again eliminating the ongoing need for the set up process. Shop drawing similar type of set up stage where it is necessary for you to pick the various sides of the design and its components that you would like to have dimensioned. Once you do that any changes to those sides in the design are dynamically reflected in the shop drawing. Understand and know how to generate the various reports in SketchList 3D. Learn to generate a parts list/cut list. 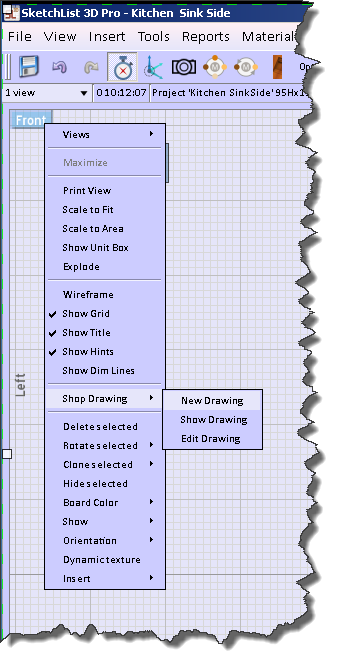 Learn to create shop drawings. Learn to generate purchase list report. Learn to export a DXF file. Learn to create a photo quality imaging. 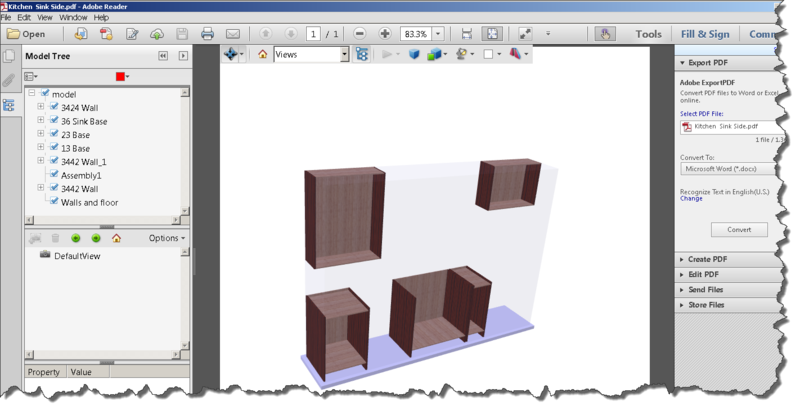 Learn to create a 3D PDF file that can be viewed in three dimensions without using SketchList 3D. Reports are organized representations of the information in the database. 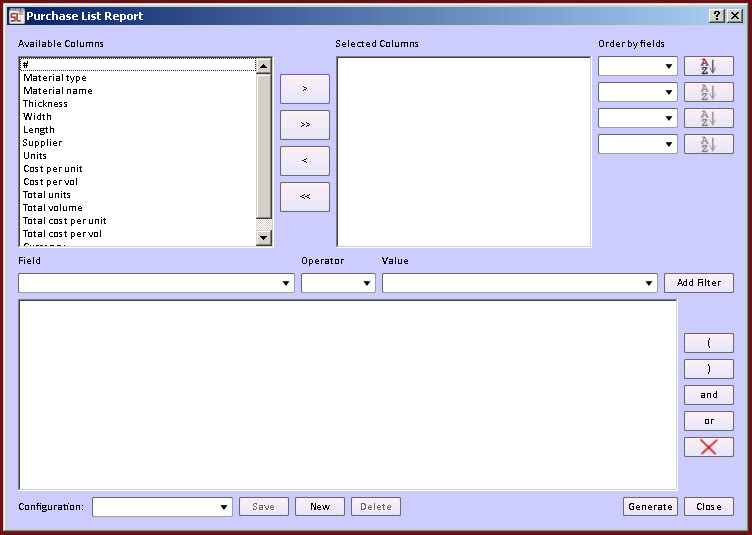 Text-based reports are generated in a column format. Drawings based reports are drank generated as images. Activities Start SketchList an important project. 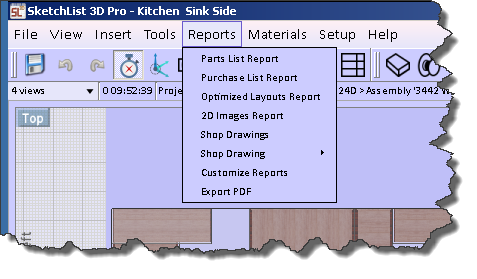 To generate a report in SketchList 3D click the menu item Report on the main menu at the top of the screen. When that menu opens select the report you want to generate. 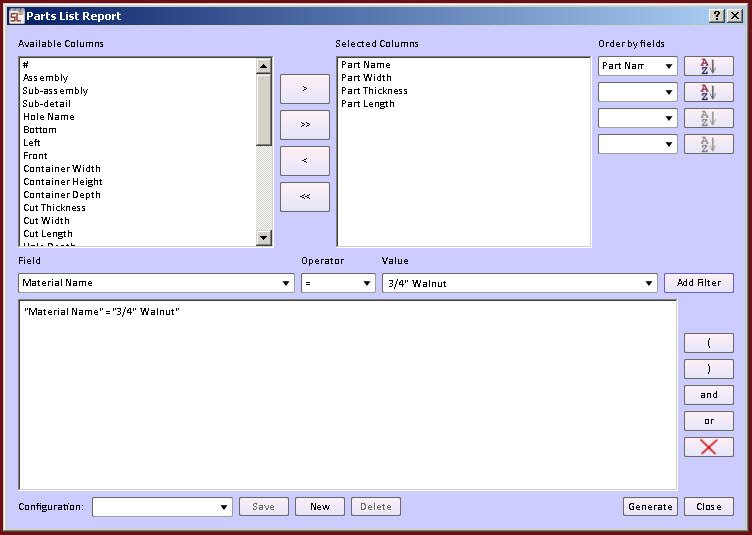 The parts / cut list report has the ability to list all parts in the database. Available columns. This is a list of all the fields in the parts database. Click on fields you want to contain in the report. Then click the arrow key. Click the double arrow key if you want to have all variables in the report. The selected columns box will fill with the information that’s going to be contained in the report. You can sort the available information by clicking the down arrow under the “order by fields” part of the form. You can create a multi-level sort by continuing down that list of four possible sort by fields and selecting values. You can filter by selecting the field, operator, and value and adding the filter. You can save the configuration or set up by clicking the new button at the bottom of the form, entering a name for the configuration, and clicking save. The next time you want to generate the specific report go to the configuration text, click the down arrow, and select the configuration you would like to use. When the report opens you can print it, save it, export it to a comma separated value. NOTE: you will see in the available columns list six sets of values for the sizes three are nominal or design sizes, and three are the cut sizes. The difference between nominal and cut is the total effect that lengthening joints have on the size of the board. For example if you have a 12 inch wide board with a ½ inch tendon on both ends that board has a 12 inch wide nominal with and a 13 inch cut with. Shop drawings are dimensioned 2D images of your design. Shop drawings can be created at the project level and when they are they show the sizes of the assemblies within the project. Shop drawings can also be generated at the assembly level and at that level you can dimension any container – doors, drawers and hardware – and all of the boards or other object assembly. When the menu drops down select shop drawing. Select shop drawing and new drawing. The shop drawing work area will open. Use the tools in the toolbox to create your drawing. Arrow tool – a line for action. Use this to select the line for example to be deleted. Edge dimension tool. Click on tool this and select an edge in the design that you would like to have dimensioned. Point to point tool. Click on this tool then click on any corner point in the design. It will turn red. Click on another corner point in the design and it will turn red and a dimension line will be struck between the two points. Sometimes corner points are difficult or impossible to select. This has to do with various aspects of how the renderings are accomplished. Eventually in these cases you will learn to build strategies that will allow you to dimension the distances you would like to see. Click the delete tool then click on the line you would like to remove from the drawing. That line will disappearThe fifth tool in the list allows you to change dimensions from decimal to fractional representation. 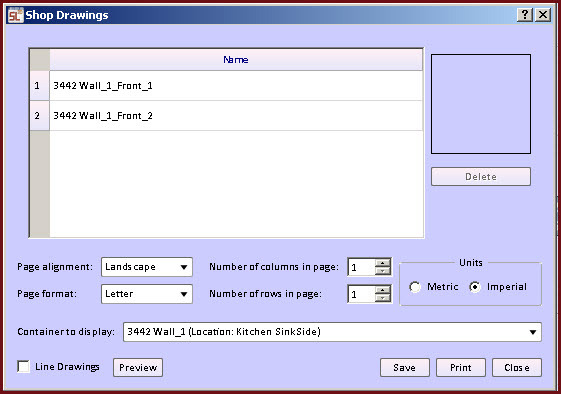 Save – you must save the drawings to be able to print them in the drawing report formats. The checkmark is the way that you save and exit this drawing. The final tool, the red X, quits this dimensioning session without saving your drawing. You will be prompted with a warning and asked if you are sure that you want to exit without saving. In the “reports” section of the main menu select shop drawings. NOTE: in order to print shop drawing you must have created one. If this form opens blank in all probability you have not yet created the shop drawing. This is the form that opens for you to select the drawing or drawings you want to print. The top portion of the form provides a list in the thumbnail image of the drawings currently defined for this project. The next section of the form allows you to specify the layout and or format you would like to use display your drawing. Page alignment is either landscape or portrait. Page format varies with the selection you make. 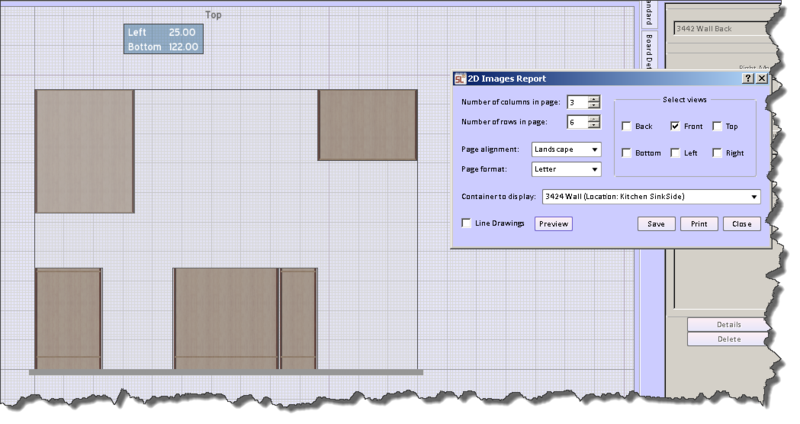 You can set the number of columns of drawing images you want on one page from one to six. Of course the more drawing of the smaller they will be rendered on the page. You can set the number of rows of drawing images you want on one page from one to six. Of course the more drawing of the smaller they will be rendered on the page. The units radio buttons allow you to display measurements in either fractional or decimal format. The container to display pulldown list allows you to choose which assembly you are create a report. Check line drawings if you want to have an outline image for your shop drawing. Preview will show you the image on the screen. Save, print, close our standard functions. Customizing report headers and footers. By using the demise report option in the reports menu list you can specify which information will be printed as part of the headers and footers of all of the reports you generate. The image at the top of the form is a preview of your form header and footer content. The zoom in and zoom out buttons allow you to magnify the preview image. The header and footer are divided into three areas: left, center, and right. You can choose the information you want in any one of those six report areas by pulling selection menus connected to the down arrow. The values that are stored and will appear are those entered in the customer section of the projects form (at the bottom) and the user information form. You can gain access to both of these forms under the main menu set up item. When you are set with the formats click the apply button. If not satisfied click cancel. 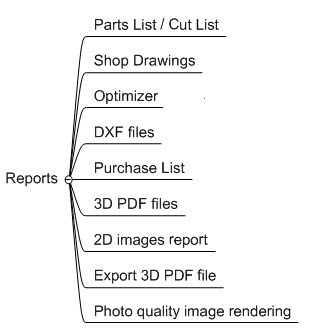 The remaining reports are integral to the optimized material layout diagram report. This is because the layout determines how many or what quantity of material of each type do you need. That information is necessary for the purchase report. 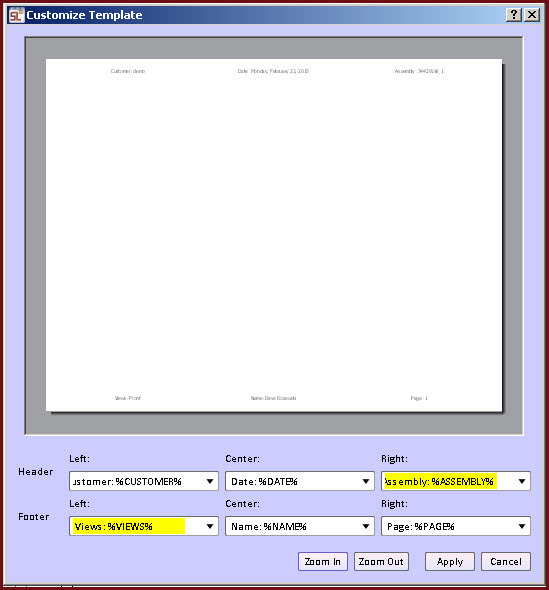 The layout report also is the source of information for exporting to the DXF file. 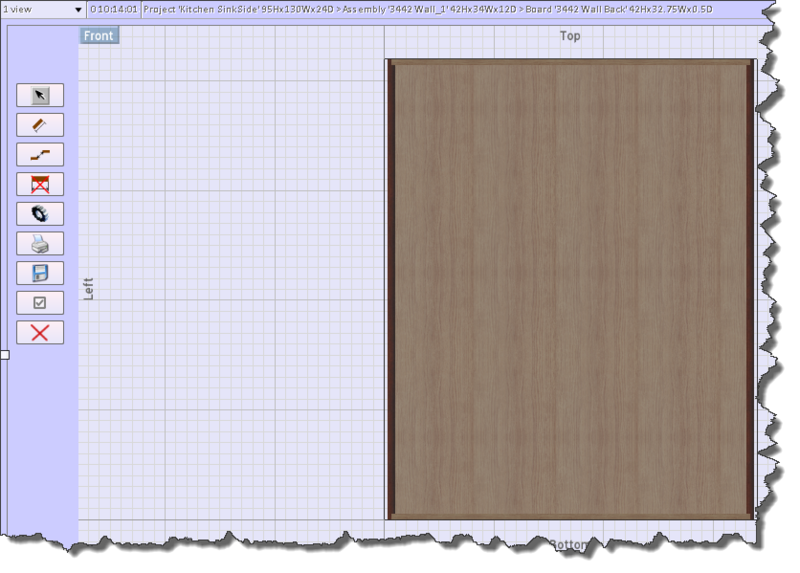 The setting up of the optimized material layout cutting process been covered in a number (32) of different blog posts. This lesson dealing with reporting will only cover the actual generation of the reports. Any preparation of a legitimate layout is covered in detail in the above-mentioned posts. In the main menu item reports click on the Optimized Layouts option. Using this form you can choose to either include all parts in the optimization or narrow the report scope. You do this by checking or unchecking the box in the optimize column. Material types which are checked will be included on the report. When you click okay the following form opens. This form displays on a sheet by sheet basis the layout for the entire project. At the top of the form you see the material. The main image of the report is the layout diagram. Below the layout diagram to spreadsheet like section that shows the part number of each numbered part in that sheet. Part number is only relevant in this report on that sheet. If you choose to save ink your printer you may select the line drawing option. You have the alternative to restrict the parts shown in the report I material type. The left and right arrows in the lower right corner of the screen allow you to page through all of the material specified. The left at the bottom contains the save, print, and export buttons. It is that export button which will create and save the DXF file. This is an amalgamation of all the parts of a given material, material type, and thickness. Given that group of parts SketchList provides a count of the number of pieces of material necessary to cut all of those parts. 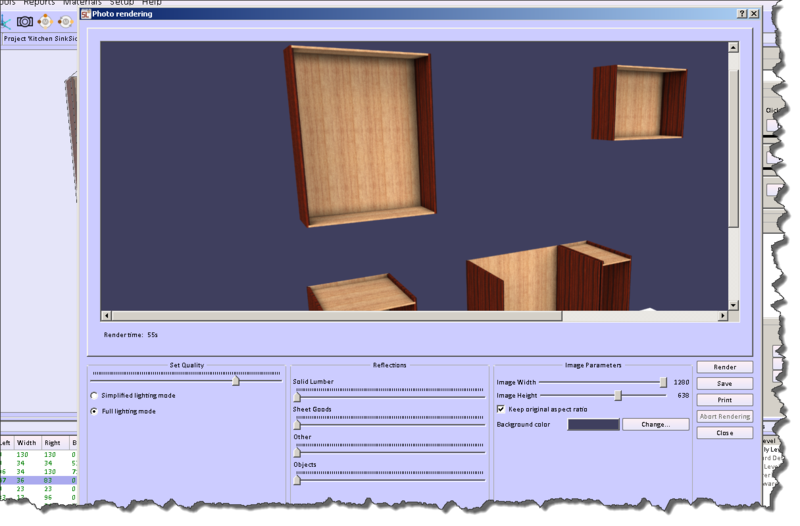 SketchList 3D uses the information generated by optimizing parts layouts the purchase report. That this reason the optimizer will run first. At the lower right corner of the optimizer form there is a Purchase Report button. This is the same interface used to generate the parts list/cut list. You can save the configuration or set up by clicking the new button at the bottom of the form, entering a name for the configuration, and clicking save. The next time you want to generate the specific report go to the configuration text, click the down arrow, and select the configuration you would like to use. Then you are ready you can save the report, export it to a comma separated value file, or print it. Under the main menu item you’ll find an entry for 2-D image report. Adobe reader 3D PDF file. This report allows you to generate an interactive 3D model as a PDF file. You can send someone who does not have a copy of SketchList 3D and they can open this model using the Adobe reader and move the model around in space to examine different aspects of your design. The Adobe reader is free and available online. Photo like quality 3-D imaging. With SketchList 3D you can create any number of high quality photo like images or renderings of your project. They may be saved in any common image file format and sent for use by others, be incorporated in your proposals, are used for design review. To create the image click the small icon of the camera in the SketchList 3D main icon bar. The following form will open. The form functions are as follows. Set Quality – Slider bar increases the quality of the image. The trade-off is that it takes more time to generate a higher quality image. You may choose to use a lower quality during the design stage and increase that for your final proposal documents and images. Simple lighting versus full lighting mode. The full might lighting mode takes advantage of multiple light sources and produces a slightly more interesting rendering with shadows. Reflections section – you can increase the amount of light being reflected off any material by material type. By experimenting with combinations of reflections you can achieve more interesting design presentation. Certainly if you create in the material type classification “other” a sheet of glass it would seem to make sense that you would have that other” type of material be highly reflective. 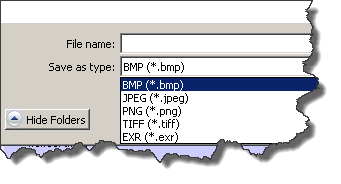 Image parameters – use for setting the image width and height terms of size. You can choose to keep the aspect ratio between width and height or let it very. Background color – background colors can greatly influence the quality of appearance of your work. Strong deep background colors and/or colors that provide contrast are much more visually interesting than weak and washed out color patterns. You save the file in any of the following formats. Once the file is saved the format it can be used in any application, situation, or need area as any other standardized image file format. This is a fairly long review the reporting capabilities in SketchList 3D. A search for the word report SketchList 3D website (www.sketchlist.com) uncovers at this time 46 entries blog posts explaining some aspect of report generation. If you need more detail than this post provides, go to the website and search for the word report.